Located less than an hour’s drive to the south of Cancun, in the centre of the Riviera Maya, the eighteen holes at the Hard Rock Golf Club (formerly Playacar Golf Club) were hewn from dense Mayan jungle by the late Robert von Hagge. Playing corridors are generally narrow and they lead to smallish greens so golfers can expect their golf game to be fully tested on a layout that’s a lot more challenging than a regular, run of the mill resort course. And because the owners of the Playacar Palace resort operate an all-inclusive policy, players certainly get their money’s worth from their green fee as it includes transportation to and from their hotel, full locker facilities and all food and drinks consumed in the clubhouse and on the course – now if that won’t temp a golfer away from the pool whilst on vacation then nothing will! played dec 2012.totaly all inclusive, drink, buggy, food and range. very very good course, well designed, tight in places, interesting and enjoyable to play, one of my favourite courses ever. 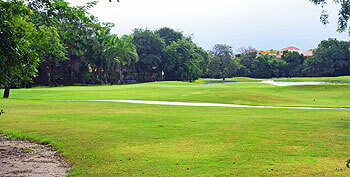 bring your A game especially off the back tees, water comes into play on a few holes. very fair and rewarding course.